This wild shrub has been used throughout history primarily to relieve the discomfort of menstrual cramps. Guelder rose is a plant native to North America and Europe and propagates wildly in woodlands, hedges, and thickets. The history of guelder rose dates back centuries, having been used by various Native American tribes for medicinal purposes. The Meskwaki people took guelder rose mainly for body pains and menstrual cramps, a use that is still prolific today and which gave the plant its alternative name, cramp bark. Other tribes used the plant for distinct purposes, including the treatment of swollen glands and lumps. It also has a place in European history, having been mentioned by Chaucer. Relieving premenstrual syndrome (PMS). As one of its popular names suggests (cramp bark), guelder rose acts like a uterine tonic, calming menstrual cramps. Alleviating muscle tension. Thanks to its antispasmodic properties, guelder rose can help relieve backaches and leg aches causde by PMS or due to physical activity. Calming anxiety. Guelder rose has the ability of soothing the nervous system, inducing relaxation. Thanks to its antispasmodic porperties, guelder rose has been traditionally used during pregnancy, in order to prevent miscarriage and premature labor. In addition, guelder rose can be used to calm asthma attacks and ease palpitations, as well as for relieving bloating and fluid retention. The pain-relieving qualities of the plant can be in part attributed to the coumarins, which also have an antifungal activity. The viopudial is the constituent that is responsible for the antispasmodic properties of the guelder rose tree, making it arguably one of the key components, as it can prevent uterine spasms, and therefore cramps, during menstruation. To date, guelder rose has been poorly researched, so there is confusion and debate over the exact active compounds it contains. It is known to contain the natural relaxant, valerianic acid, which can promote a sense of mental well-being and has a natural sedative effect. Guelder rose is known to be a natural relaxant, and its antispasmodic qualities can prevent menstrual cramps. Similar antispasmodic properties can be found in dill, linden and thyme, whereas lemon balm, lavender, and passion flower are commonly used for treating anxiety. 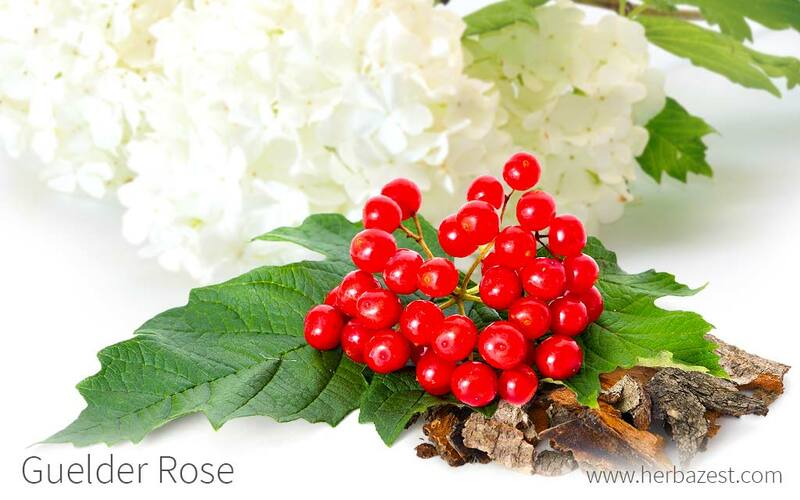 The side effects of Guelder rose, or cramp bark, have not been extensively studied; however, it is known that coumarin compounds are toxic if taken in high doses, so the herb must be consumed only under medical supervision. There is no information on the safety of the guelder rose during lactation, so nursing women are advised not to consume the herb. Guelder rose does not have many common culinary applications, as the plant is largely used for medicinal purposes, and is more commonly marketed by its alternative name: cramp bark. Its berries are sometimes made into jam. Infusion. The dried bark of guelder rose, also known as cramp bark, can be brewed to extract its medicinal properties, which are useful for soothing the nerves and calming muscle cramps, as well as painful menstruation. Liquid extract. Product of a distillation process, this remedy can be diluited in water and consumed orally in order to relieve muscle cramps, as well as the symptoms of premenstrual syndrome. Capsules. marketed for muscle comfort, this supplemental form of cramp bark is particularly useful, since it comes in standardized, easy to swallow daily doses. Guelder rose seeds and fresh plants are available from garden centers, or plant nurseries for planting purposes, while the dried parts of the plant, often marketed as cramp bark, can be found in both bulk form and as teabags in specialized health stores, as well as through online retailers. Cramp bark liquid extracts and capsules are available at specialized health stores, but online retailers usually stock a wide variety of brands, bringing attention to the primary use of the herb for musculoskeletal support, as well as for the treatment of menstrual cramps. Patience must also be exercised with this plant because, even with the best of care, it will not grow for about another year. It is best to pre-treat the seeds by planting them in a pot with good drainage and placing it a shady place for a few months. Guelder rose planting is best done in May, with the seeds being sown at least 0.3 inches (5 mm) apart and a roller being used to press them well into the ground. It is important to keep the seed moist at all times because they thrive in damp, woody climates. When the seedlings emerge, keep them well-watered, but do not expect leaf growth until the next spring, because another cold period is required for the the seedlings to grow. Also known as cramp bark, American cranberrybush, and European highbush, guelder rose is a perennial that can grow up to 13 feet (4 m) high. Its bark is a gray-brown color, and the leaves can be oval or round and up to 4 inches (10 cm) in width. The guelder rose flowers are white and occur in wide clusters, with only the middle flowers being fertile. In high summer, the bunches of bright red berries are ripe to eat. Guelder rose (Viburnum opulus) is a member of the Adoxaceae or muskroot family, which is composed mostly by herbs and shrubs, and comprises about 200 species across five genera. Black haw (V. prunifolium), which is often used interchangeably with V. opulus. Mapleleaf Viburnum (Viburnum acerifolium), native to eastern North America and more shade tolerant than many of the other species in the genus. Bitchiu Viburnum (V. bitchiuense), which also has pink buds and white, fragrant flowers. Bodnant Viburnum (V. x bodnantense), which is grown primarily for winter bloom and blooms small, loose clusters of fragrant pink flowers. Fragrant Snowball (V. x carlecephalum), whose white flowers are fragrant, long-lasting, and bloom from March to April. There are three main subspecies of guelder rose: American cranberrybush (V. opulus var. americanum), guelder flower (V. opulus var. opulus), and Takeda (V. opulus var. sargentii). Because of its beautiful appearance and easy maintenance, many cultivars of Viburnum have been created, mainly for ornamental purposes, such as 'Cayuga', which grows black berries in late summer and it is highly tolerant to bacterial leaf spot and powdery mildew; 'Emerald Luster', which has exceptionally nice, lustrous foliage; 'Autumn Jazz', with red, yellow, orange, and burgundy fall colors; and 'Erie', insect and disease resistant, with unusually colored coral-red fruit that last until spring. Guedler rose has been cultivated since the late 17th century and has been mentioned by Chaucer. It has also been used by Native American tribes for centuries as a treatment for body pain and menstrual cramps. Guelder rose is an invasive plant that is widely regarded as a weed rather than revered for all its medicinal benefits, although there is a small cultivation industry. It is considered a nuisance, and for this reason, it has an unfavorable status in the USDA Plant Database; it is reported as highly invasive and undesirable in a variety of official publications. Therefore, the economic importance of guelder rose is low, and there is no guelder rose market to speak of. It does, however, have importance in the herbal medicine industry, with cultivation being mainly for this purpose, or occasionally for ornamental uses. "Guelder rose is important to the herbal medicine industry." Gardening. The guelder rose tree or shrub is attractive enough to sometimes be raised in gardens and parks for its aesthetic value. Timber. The bark is sometimes used for firewood or making wooden products. Integrated Taxonomic Information System, Viburnum opulus L.